This course is designed to help environmental professionals develop and improve specific communication skills that will more effectively deliver regulatory, and/or scientific, technical information and ideas. Effective and professional communication and public presentation skills are critical to the success of today’s environmental professionals, in every field. Each professional is expected to deliver clear information, but in order to be truly effective, he or she must also tell a story that engages and informs the audience by imparting a powerful message that compels them to take action and initiate change. Through a team-based, interactive, accelerated learning format, each participant will develop his or her own personal communication and storytelling style by weaving themed, technical content with an intentional message. In combining these important skills, each participant will learn how to present a story that delivers the most powerful and compelling information that will engage and resonate with their audience. Each session is geared to the interests and instructional needs of the participants and the group as a whole. 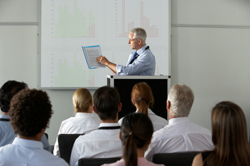 The course work applies the most current ideas in effective oral communication techniques, with individual and group practice sessions reinforcing the skills presented. Participants will receive a pre-course packet with an introduction to accelerated learning philosophy and methods, a course outline and references to familiarize them with the course content. In order to customize the course to the needs of participants, each participant will be asked to answer a short survey that will allow the instructor to tailor the course material to be uniquely relevant to the individuals, organizations and groups represented in the class. *Reduced tuition is available to employees of Native American tribes, government agencies, nonprofits, students and NAEP members. Participants will receive a pre-course packet with an introduction to accelerated learning philosophy and methods, a course outline and references to familiarize them with the course content. In order to customize the course to the needs of participants, each participant will be asked to answer a short survey that will allow the instructor to tailor the course material to be uniquely relevant to the individuals, organizations and groups represented in the class. Attendees will receive a course manual at the course containing workshop proceedings and reference material. This workshop is intended for environmental professionals who would like to develop better communication and presentation skills, for personal and professional development. The skills learned in this class are applicable to communication to a variety of audiences in meetings, presentations and other situations where persuasive, professional, environmental, scientific and technical communication is expected. Attendee replacement acceptable at anytime. Course registration fees and cancellation policy are subject to change without notice.